Discuss the theme of conflict in "Romeo and Juliet." 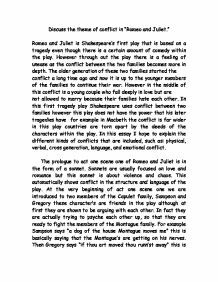 Romeo and Juliet is Shakespeare's first play that is based on a tragedy even though there is a certain amount of comedy within the play. However through out the play there is a feeling of unease as the conflict between the two families becomes more in depth. The older generation of these two families started the conflict a long time ago and now it is up to the younger members of the families to continue their war. However in the middle of this conflict is a young couple who fall deeply in love but are not allowed to marry because their families hate each other. In this first tragedy play Shakespeare uses conflict between two families however this play does not have the power that his later tragedies have for example in Macbeth the conflict is far wider in this play countries are torn apart by the deeds of the characters within the play. In this essay I hope to explain the different kinds of conflicts that are included, such as: physical, verbal, cross generation, language, and emotional conflict. The prologue to act one scene one of Romeo and Juliet is in the form of a sonnet. Sonnets are usually focused on love and romance but this sonnet is about violence and chaos. ...read more. During the Shakespearian period this would have been one of the favourite scenes because of all the violence. The people of the time would have enjoyed watching an action fight scene just as much as we do today. At the beginning of the scene Mercutio, is going a bit mad for no apparent reason. The two different film versions of the play I have seen convey this in different ways. In the version directed by Luhrmann which is the version made with guns instead of swords. This version show Mercutio's madness by him sitting on the beach firing aimlessly at fish in the sea. In the Zeffirelli version of the film the madness is shown by Mercutio walking around with a wet towel over his head talking gibberish, also in both version Mercutio is accusing Benvolio of being a violent character which is certainly not true. After a while in both versions tybalt shows up and tries to start a fight with Romeo. But Romeo does not want to fight tybalt because now he is married to Juliet they are related and he does not want to hurt Juliet and kill his and her relatives. But tybalt doesn't now this so he still wants to fight Romeo. Both versions of the film show tybalt's action's when he kill's Mercutio as an accident. ...read more. You can easily se the emotional conflict and turmoil from Juliet's deeply emotional language. "O God!--O nurse, how shall this be prevented." the emotional conflict shown here would have been extremely entertaining to the audience watching the play. This is the final and most upsetting scene of the play in my opinion because, this is the scene when Romeo and Juliet both kill themselves. It is also the scene where paris the man Juliet was supposed to marry dies. This death however seems to be out of place. His murder by Romeo seems to show the sheer desperateness of Romeo to get to Juliet's body. After this Romeo see's Juliet's body and he thinks she id dead, so he takes some poison and lays dead next to Juliet. But as he dies Juliet wakes up and finds Romeo dead so she kills herself as well. This is an extremely sad but romantic ending to the play. Although both Romeo and Juliet died at the end of the play there is a huge amount of irony that there death meant peace between the two house's of the Montague's and the Caplets. These lovers finally manage to unite the family in grief. And resolve the long standing conflict. As you can see Romeo and Juliet is filled with many different kinds of conflict ranging from emotional, physical, family and language conflicts. All of these points put together create the perfect tragedy and make a brilliant play. ?? ?? ?? ?? ...read more. "Doth with their death bury their parents' strife". Shakespeare uses this technique called 'dramatic irony' throughout the play, it enables the audience to watch the play with expectation and sense the tension. The Prologue also reveals themes and imagery to bring the themes to life, such as, love, conflict, time, fate, life, death and power. 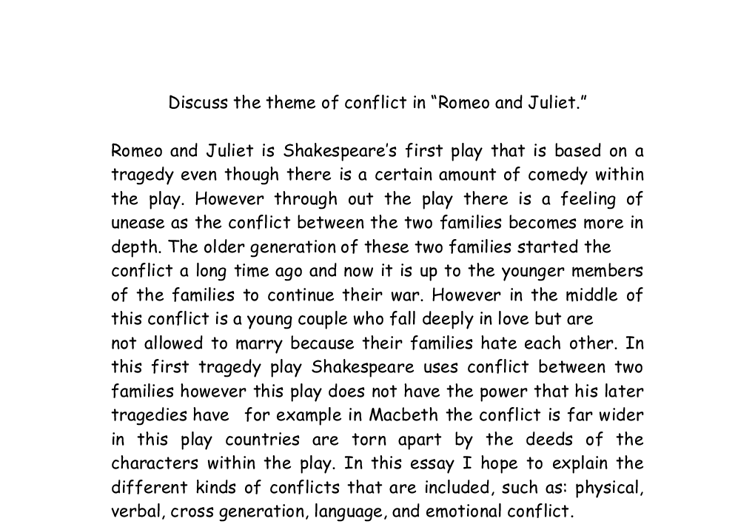 Romeo and Juliet theatre production essay. This would also blend together with the acting as the combination of swishing swords, loud, boisterous accompanying music, verbal participation from the audience and continuous motion around the stage with swirling and swishing swords would combine together to result in a explosive, energetic and vibrant atmosphere and proceeding. Sampson then bites his thumb at Abraham and an argument brakes out. And yet again the Capulets show how more intellectually challenged they are compared to the Montagues, as Abraham is cleverly winning the argument and all Sampson and Gregory can do is bite their thumbs and spit. His posture is straight and he holds his head high, portraying confidence. Although there is the obvious difference in period and costume, the character of Tybalt is presented in a similar fashion in both the film extracts. In Luhrmann's film he too is filmed feet upwards, portraying his as a figure of power and strength. At the end of this particular scene the same piece of music fully modulates into a minor key, which by definition is darker sounding and less romantic, fitting with the images of Tybalt as a contrast to the earlier, romantic section of the scene.